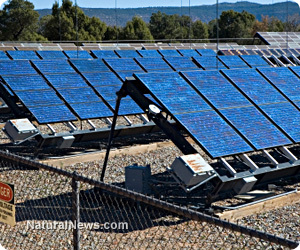 (NaturalNews) There has been nothing you could call "successful" about President Obama's so-called "green energy" initiatives, but the worst thing of all is the billions in taxpayer dollars he has utterly wasted on failed companies who were trying to push unproven, and ultimately failed, initiatives. Indeed, according to new data, the Obama Administration has spent an incredible $11 million for each "green" job that has been created, Breitbart News reports. Recall for a moment that candidate Barack Obama, in 2008, promised he would create a whopping 5 million new green energy sector jobs if elected. "Drilling (for new oil supplies) is not a long-term solution to our problem, not even close," Obama said in Denver. "And that is why I will invest (i.e. spend) $150 billion over the next decade, working in partnership with states and local governments and the private sector...we are going to invest in affordable, renewable sources of energy. Wind power, and solar power, and the next generation of bio-fuels...an investment that will lead to new industries and 5 million new jobs that pay well and cannot be outsourced." Well, that was then. Today, more than four years later, Obama's "vision" has been an abject, expensive failure. A study by the Institute for Energy Research found that the Department of Energy, under Obama's tenure, has spent in excess of $26 billion since 2009, creating just 2,298 permanent positions - at a cost of more than $11.45 million per job (see the data chart here). -- More than $1.5 billion was spent on "wind generation," though there isn't much improvement to be made to a technology that still depends on, well, the wind to blow. In all, especially at a time of dire budget constraints and gross overspending, the money spent was not spent well. "The losers are the American workers who would otherwise be gainfully employed but for the tremendous waste of taxpayer dollars on the administration's obsession with 'green energy,'" IER Policy Associate Alex Fitzsimmons said. "As the economy continues to suffer and dollars for federal programs get harder to come by, it is getting increasingly difficult to defend a program that costs so much and produces so little." Also, notes Breitbart's Winton Hall: "In his New York Times bestselling book, Throw Them All Out, Government Accountability Institute President Peter Schweizer revealed that 80 percent of Department of Energy loans went to companies owned by or connected to President Barack Obama's top campaign fundraisers." 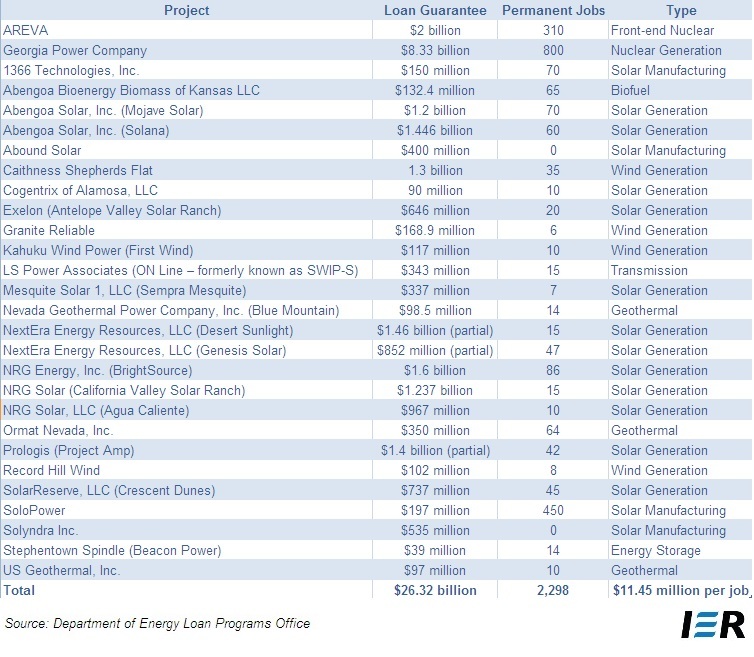 The blog Green Corruption's "Obama green-energy failure" list contains 23 bankrupt and 27 troubled green energy companies which were backed by the federal government. ... According to the Heritage Foundation, $80 billion was set aside in the 2009 stimulus package for clean energy loans, grants, and tax credits, and 10 percent of these funds have gone to companies that have filed for bankruptcy or are in dire straits. As evidenced by his administration's anti-oil policies, Obama is obviously comfortable with making you pay higher prices for gasoline while he wastes your tax dollars on industries with unproven technologies that aren't doing a thing to lower your energy costs - a lose-lose for most Americans.